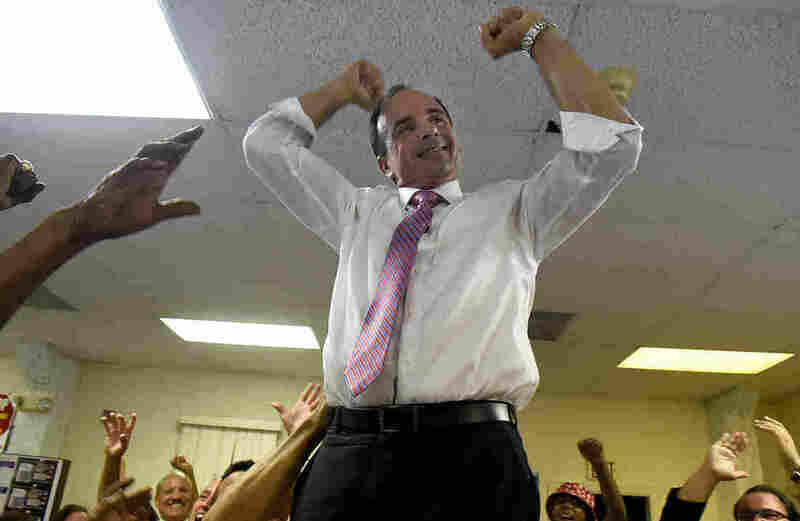 5 Years After Release From Prison, Former Conn. Mayor Wins Primary : The Two-Way The primary win may propel Joe Ganim, 55, back into office in mostly Democratic Bridgeport, the largest city in Connecticut, five years after he was released from a federal prison. "Ganim's message that everybody deserves a second chance earned the former felon the endorsement of the city's police union and the support of the FBI agent who'd locked him up," Diane Orson of member station WNPR reports from New Haven. The primary win may propel Ganim, 55, back into office in mostly Democratic Bridgeport, the largest city in Connecticut, five years after he was released from a federal prison. Ganim was Bridgeport's mayor from 1991 to 2003, when he was convicted of numerous counts of corruption. "Ganim was found guilty of steering city contracts in exchange for hundreds of thousands of dollars in gifts like wine and clothes," Davis Dunavin of member station WSHU reports for our Newscast unit. "He apologized for his actions." In the primary race, Dunavin says, Ganim "said he took the high road against his opponents, current mayor Bill Finch and businesswoman Mary Jane Foster."